Evelina Petrova is a rare find in a world of ever-repeating, inward-spiraling popular music. This bright flame shoots off at a wild tangent from the safe traditions of folk music and challenges the most avant-garde of contemporary classical composers. Frank Zappa meets Valkyrie Handmaiden-on-testosterone. Banshee wailing over complex chording and lightening melodic ripples. Big, powerful, yet often delicate and feminine, Evelina toys with her audience, scary grunting one minute and scattergun girly crooning the next. 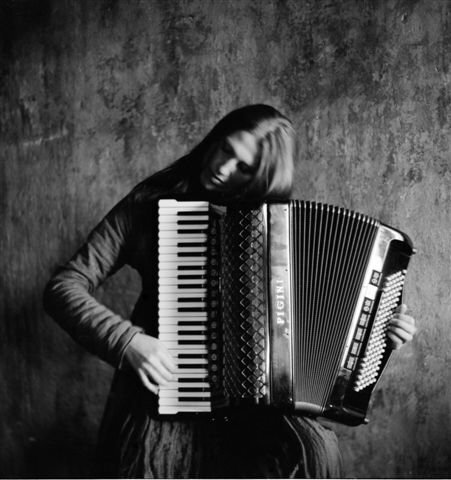 Her accordion playing is scholarly and masterful while evoking comparisons with the folky, improvisational excellence of close neighbour, the Finnish maestro, Maria Kalaniemi. Having had the brief pleasure of her musical and personal company as a guest with us on stage recently in St. Petersburg, Russia, I can confidently predict her effect on audiences everywhere. She will assault your ears, heart and soul in short order and redefine your perception of stark femininity at its most primitive level. Evelina (Evelyn) Petrova ‘s first solo album is «Year’s Cycle» — a collection of songs reflecting the months of the year in music and song. With lyrics based often on traditional Russian folk songs and music mostly from Evelina herself, the combination is magic. Settle back with some iced Stolichnaya Vodka, close your eyes, open your ears and feel the pulse of Mother Russia as her seasons go by…..